If you are a Braves fan this was the one highlight from last night's rout by the hands of Bryce Harper and the Nationals losing 14-4. Freddie Freeman set an Atlanta Braves franchise record by reaching base for the 12th consecutive time by hitting a solo shot into the SunTrust Park fountain just beyond the centerfield fence. Freeman's 6th home run of the year kept his scorching hot bat going where his OPS is at a ridiculous 1.453 while he leads the majors in batting average at .440 and on base percentage at .533. Even with Freeman's 6 HRs, 4 doubles and 1 triple he only has 8, yes 8 RBIs, batting 3rd in the lineup. Why only 8 RBIs? Because the man batting in the 2 spot aka Dansby Swanson has been horrible the first two weeks of the season (155 OBP) and simply can't get on base to set the table for MVFreeman. Brian Snitker gets paid handsomely to manage the Braves albeit only a one year contract so he needs to do the right thing and drop Dansby in the order while either putting either Nick Markakis (367 OBP) or Brandon Phillips (362 OBP) in the 2 spot in front of Freeman. It's an absolute crime for Freeman to only have 8 RBIs. Roll with this lineup for at least a week while dropping Dansby to 7 or 8 in the lineup and see where your chips fall. 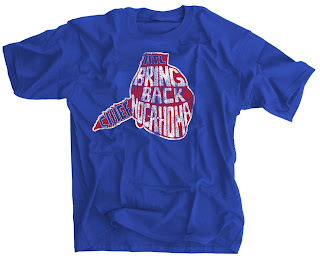 Order our Bring Back Chief Noc-a-Homa Shirt Here!